I'll admit, I have never seen a single episode of The Smurfs. I know absolutely nothing about The Smurfs, other than that they are blue and appear to spend a lot of time around giant mushrooms. That being said, when I saw this Too Faced Smurfette Collection Starry-Eyed eyeliner on Sephora.com, Smurf-fan or not, I had to have it. The shade is called, "Smurf You." Is that supposed to be as naughty as it sounds? Quick, blurry swatch. It's a vibrant medium blue with a little bit of silvery blue glitter mixed in for contrast. Looks extremely hot over black eyeliner. Too Faced Starry-Eyed glitter liners are my favorite glitter liners ever, and this color is a perfect addition to the line. I didn't get the other shade, but I probably will soon. Everything about this liner rocks, so the other one has to be good! have you tried the NYX candy glitter liners? they're pretty good too. That looks hot. Hope that collection will show up in Europe too. It IS supposed to sound naughty. The show was kind of wacked that way. Tons of guys, only one girl? WTF? All the guys had names, she was just Smurfette. There to be used. So not feminist. Would you please post a picture of your eyes with it on? I like the idea of putting it over black. So I went to Smurfphora and Smurfed the the Smurfette collection. As much as I love the Smurf you eyeliner, I probably won't be super-inclined to snag it, since I don't wear blues that often. 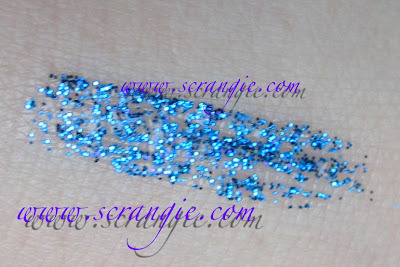 Also, the Sephora brand white glitter eyeliner is almost an exact dupe for the Feelin' Smurfy color, and cheaper too. I do love the color the mood change lipgloss turns on my skin, but I have a moratorium on lip gloss purchases right now. Steph_mark, ooh no I haven't! Thanks for the rec, I'll have to go look at them. My Ulta carries a limited selection of NYX now so hopefully they have these! Sanna, yay, now I'm not alone :) I like the cute blue packaging!